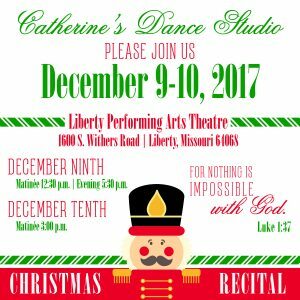 Our December Recital is just around the corner and we want to keep you up to date on all that is happening at Catherine’s Dance Studio. This time of year can be difficult to juggle all that is going on. We understand. So with that in mind, here is what you need to know for the upcoming Christmas Recital. No dance recital is complete without wonderful portraits of all our beautiful dancers. Mark your calendars for portraits from SPC Portrait Art. They have been our photography partners for years and always capture the most spectacular pictures of our dancers. Check the list above for your session time(s) and please arrive early. Group pictures will be taken first, so don’t be late. The listed times are when pictures will be taken, so be sure to be all ready to go before your time slot. Also, be sure to bring your checkbook, credit card or cash for ordering prints. Once again our wonderful dance mom Sara Quarrato is offering beautiful flowers for our girls. 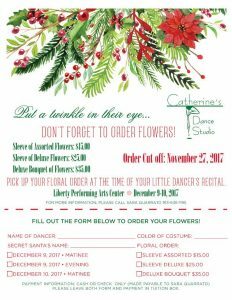 Moms and Dads, grandparents, neighbors, brothers, and sisters can order flowers for their favorite dancer. 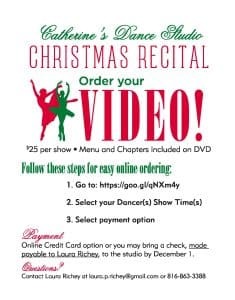 Orders will be prepared and ready at just the perfect time for your specific dancer on the day of the recital. Please print and fill out the above order form before November 27th, include payment and drop in the tuition box at the studio. 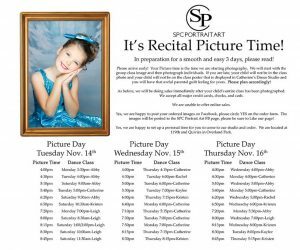 Be sure to mark the correct recital time on for your dancer(s). 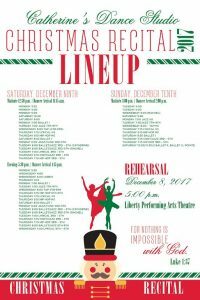 And finally, mark your calendars for our magical Christmas Recital to take place at the Liberty Performing Arts Theater. Rehearsal will take place Friday, December 8th at 5 pm. Saturday, December 9th will be the matinee at 12:30 pm and an evening show at 5 pm. Sunday, December 10th’s show will take place at 3 pm. Please be sure to check the line up for performance times for each dance class. This recital is such a special time for our dancers, their families and for our studio. We thank you for all your efforts to be on time for each event. Remember, “For nothing is impossible with God, “ Luke 1:37. We can’t wait to see all our dancers shine on stage.